The closest area airport is the Norfolk International Airport which is located about 20 minutes from the Oceanfront. Another option is the Williamsburg-Newport News International Airport which is located about 50 minutes from the Oceanfront. 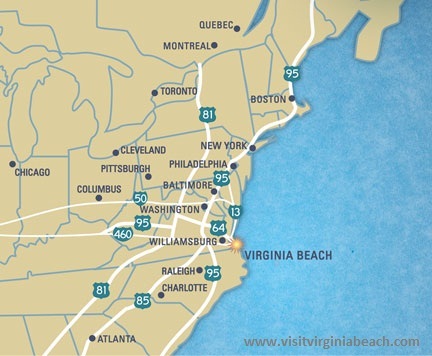 Virginia Beach is just 3 ½ hours from the Washington DC Metro area and about 3 ½ hours from Raleigh/Durham, North Carolina.